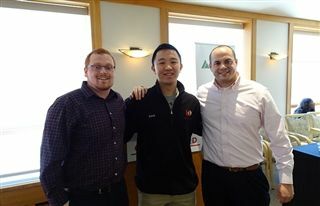 On Thursday, February 14, students from high schools around Connecticut gathered at the University of Hartford Barney School of Business for a career day hosted by Junior Achievement entitled: An Exploration of Risk Management & Insurance. Senior Jack Gao represented Kingswood Oxford. The day came with guidelines: learn something, feel respected and respect the presenters, and have fun. The keynote speakers were Ryan Jaswell, managing director of the product management development program at Travelers Insurance and University of Hartford graduate Josh Young, who also now works at Travelers. Both enthused that despite risk management and insurance's less than exciting reputation, the fields are lucrative and rewarding. In addition to speakers, the day offered three concurrent sessions that participants rotated through, as well as a presentation on the summer business institute. Both shared a favorite quote by Golden State Warrior Kevin Durant: “There is no substitute for hard work. Hard work beats talent when talent doesn’t work hard.” The two encouraged participants to leave stodgy perceptions about “selling insurance” at the door. They highlighted that a large population in this field is headed towards retirement. Combined with a 12 to 15-year reduction gap in people entering the job, the insurance business needs young, dynamic individuals more than ever. Other benefits of the insurance market include an unemployment rate of 2%, which is 2.3% less than the national average of 4.3%. Insurance, typically viewed as a cubicle job, has a new look with cutting edge technology and artificial intelligence. Want to be a drone pilot? Travelers has the biggest drone fleet of any insurance company. Claims that took weeks or even months to close now takes minutes because of the drones' capacity for on-the-spot analysis. And, with progressive computer programs, experts can recreate virtually a home prior to a disaster. Other initiatives at Travelers include the recent launch of Traverse, a first-of-its-kind personal insurance product to protect a person, their stuff, and their experiences. Travelers is also the first to partner with Amazon to offer smart home kits and insurance and risk management information through the insurance industry’s first digital storefront. Participants also heard from a panel of students from the University of Hartford Barney Business School, which ranks among the top business schools in the country, who shared their experiences and suggestions of what to look for in both a college and a career.